The Ultimate Set for anyone that loves their beard! Complete with the 5 essential signature Beardsley and Company Beard Care Products presented in an attractive and functional pinewood box. Includes: Wild Berry and Cantaloupe Ultra Shampoo for Beards, Beardsley Ultra Conditioner for Beards, and Beardsley Oil for Beards and Beardsley Lotion for Beards. Beardsley and Company products are specially formulated for beards and moustaches. It will leave your beard and moustache clean and fresh. The Beardsley Ultra Conditioner tops this off, leaving your beard feeling soft and skin feeling smooth. 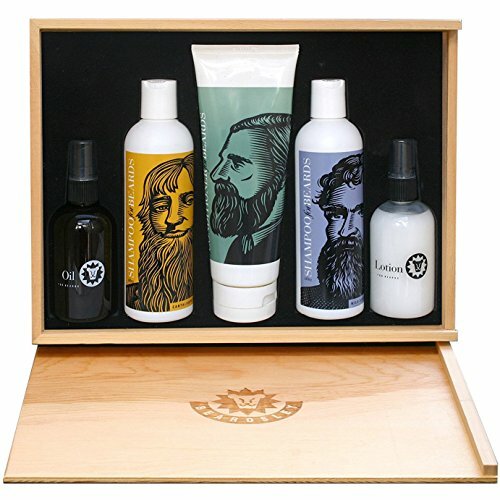 Beardsley Lotion for Beards is a unique product with a cooling, aromatic Bay Rum scent. Beardsley Oil for Beards is a lightweight, anytime-use oil which delivers easy-to-comb, manageable results. Beardsley Ultra Shampoo (2 x 8 oz, cantaloupe and wild berry flavors) is specially formulated for facial hair. It will leave your beard and moustache clean and fresh. Beardsley Ultra Conditioner (8 oz) is a special formula for beards. It will leave your facial hair feeling unusually soft and smooth. Apply a small amount after shampooing and rinse. Beardsley Lotion (4 oz) for Beards is a unique product with a cooling, aromatic Bay Rum scent. Apply 2 to 3 sprayer depressions, rub palms together and massage into beard. Brush and style. Beardsley Oil (4 oz) for Beards is a lightweight, anytime-use oil which delivers easy-to-comb, manageable results. Apply 3 to 5 sprayer depressions, rub palms together and massage into beard. Brush, comb and style. If you have any questions about this product by Beardsley and Company, contact us by completing and submitting the form below. If you are looking for a specif part number, please include it with your message.